For the majority of the year, the nighttime isn’t the right time to be a kid. From September through early June, almost every night is a school night, which means doing homework and getting enough rest to tackle the long day ahead. Add to that the early setting sun of winter, and the cold days and even colder nights, and it’s easy to see why adults and kids alike keep most activities indoors until spring comes to town. But once spring does come, and school days end for the year, it’s time for every kid’s favorite six letters – S-U-M-M-E-R! And with it comes much more time to relax and play away the day, and later bedtimes for many young folks. Skittles Sour Light Up Spray Candy: Sour Strawberry, Green Apple and Blue Raspberry sprays are a novelty made for the night! With terrifically tart Skittles flavor, each box is packed with 18 pieces. Flash Pop Rings: Kids will love this lick-activated flashing lollipop! With a bright, flashing light inside, brought to disco life when you lick, these are fun to wear and full of flavor. 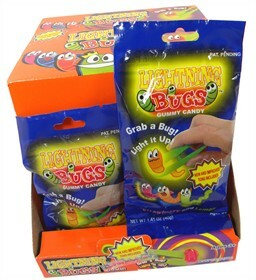 Lightning Bug Gummi Candy: As fun as lightning bugs are to watch and chase around the yard for a closer look, they can also be fun to eat! Well, sort of. Just leave those lovely little flying ones alone and tempt your sweet tooth with our lightning bugs, OK? Ours come with a special set of tweezers that illuminates the gummy ‘bugs’ inside when you or your little ones pick them up. Happy Independence Day, everyone! And thanks for taking a few minutes to stop by between burgers grilling and fireworks popping. Since we’re in full 4th swing here as well, we thought this would be the perfect time to share some of our own treat ideas with you, each of which is ideal for Independence Day, but would work all summer long! Red, White and Blue Berries: We’ve seen strawberries popping up all over Facebook, dipped in white chocolate before getting the sugar treatment with blue candy crystals. Plenty of parents have been posting them as their kiddos helped with their creation, and they really couldn’t be cuter! But we do think there’s something that might taste even better than blue sugar – Blue Sixlets. The combo of chocolate, white chocolate and strawberry is what freedom is all about! Revolutionary Red Velvet Cupcakes: We aren’t going to lie; there isn’t much you can do to a red velvet cupcake topped with buttercream frosting to make it any better. It’s like the Ryan Gosling of cupcakes – so close to perfection that it isn’t worth the risk of trying to make it any more amazing! But we like to live on the edge – we like to push the envelope on awesome. But only a little! So we’ll be sticking with our favorite recipe for red velvet cupcakes and buttercream frosting, and dropping just a few Blue Sixlets atop each to make it as American as it is delish! Patriotic Jello Petites: When the summer sun is beating down and temps are climbing into the 90s, many of us look for lighter treats to snack on. And today looks as though it’s shaping up to be quite toasty! This one requires just a few minutes and a few ingredients. You can purchase already-made red Jello packs (strawberry is my fave! ), or make your own at home in small glasses or even Dixie cups. Once the Jello is ready, squirt on a little whipped cream and garnish with Blue Sixlets. Easy, economical, and not a ton of calories!